Prof. Tirthabir Biswas received his PhD from the CN Yang Institute of Theoretical Physics at Stony Brook University in New York in 2003. His thesis involved looking at different ways "extra dimensions" could come into play in high energy physics, both as "real" dimensions influencing the cosmology of the very "Early Universe", as well as "mathematical" constructs which, for instance, can lead to a deeper understanding of field theories in certain curved space-times such as the de Sitter and the anti de Sitter. Thereafter he pursued post-doctoral studies at McGill and Penn State Universities where his research became more focused on cosmology and gravity, although his work was often inspired by fundamental theories such as string theory and supergravity. Dr. Biswas has also held visiting positions at St. Cloud State University and University of Minnesota. Over the years Dr. Biswas has published more than 40 articles in top-tier research journals and has made several pioneering contributions: He was one of the first to look into applications of “stringy” nonlocal physics to cosmology, gravity and field/particle theory. 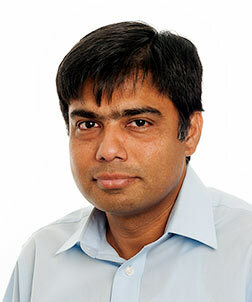 Dr. Biswas played an important role in understanding the effects of large scale inhomogeneities in our universe in the context of the “cosmic speed-up/dark energy” puzzle, as well as on how they can lead to systematic uncertainties in cosmological measurements. He has also proposed and developed several “Early Universe” models, such as p-adic inflation, Bounce inflation and string gas cosmology. His recent “cyclic inflation” proposal, summarized in the essay “Before the Bang”, received an “Honorable Mention” in the 2013 Gravity Research Foundation essay competition. His current research ranges on a variety of different topics, from looking into the earliest moments of time when the universe was incredibly hot and dense, to the epoch when ''dark energy'' took over our universe after billions of years of evolution. Gravity has been the overarching force that has shaped our cosmic history, it is also the force that is least understood by theorists. Some of Dr. Biswas' research also involves looking beyond Einstein's theory of gravity and especially what it might imply for cosmology. Prof. Biswas has taught several courses in physics to students in the sciences and engineering, introductory and as well as advanced. He has also designed and taught physics and astronomy courses for non-science students. Besides, Loyola University, Prof. Biswas has taught at McGill University, Penn State University, University of Minnesota, and St. Cloud State University. Loyola University has a very active Student Physics Society (SPS). As the advisor of the SPS at Loyola University, Prof. Biswas has helped the students organize several outreach events for school students. Loyola students are definitely a committed and enthusiastic bunch. The SPS also hosts monthly seminars especially designed for undergraduate students.